Fasten your seat belt and get ready to head down the road with Warren Faidley, storm chaser and photographer, as he uses his camera to capture some of nature’s most dramatic moments. Warren’s photographs have appeared in books, magazines, and scientific films all around the world. You’ll learn how Warren photographs lightning storms over the desert. You’ll accompany him on a day when he saw seven different tornadoes. And you’ll hear him describe the howling winds outside the parking garage where he photographed the fury of Hurricane Andrew. 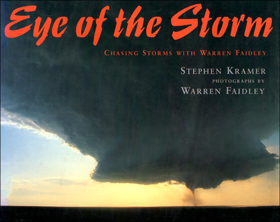 The remarkable stories and magnificent photographs in this book will give you a new appreciation for the beauty, danger, and awesome power of violent weather.